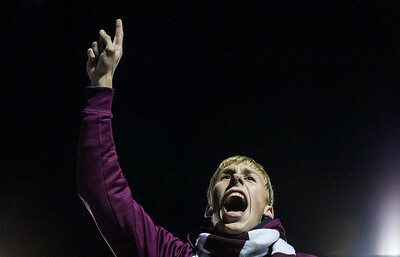 Kyle Grillot - kgrillot@shawmedia.com Marengo senior Dylan Marks leads the student section in a cheer during the third quarter of the homecoming game against Burlington Central Friday October 3, 2014 in Marengo. 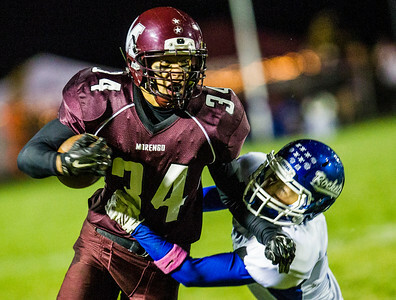 Marengo lost to Burlington Central, 21-13. 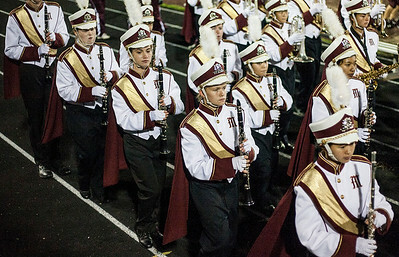 Kyle Grillot - kgrillot@shawmedia.com The Marengo Marching Band enters the field before the start of the first quarter of the homecoming game against Burlingon Central Friday October 3, 2014 in Marengo. 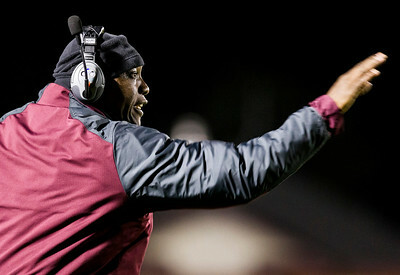 Marengo lost to Burlington Central, 21-13. Kyle Grillot - kgrillot@shawmedia.com Marengo's Edilio Andarado unsuccessfully tackles Burlington Central's Jason Berango as he enters the end zone during the second quarter of the homecoming game Friday October 3, 2014 in Marengo. 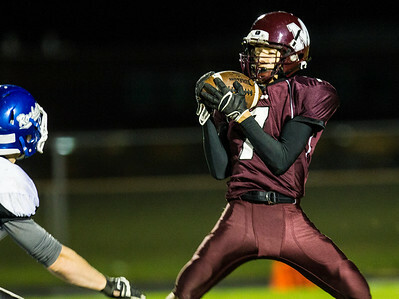 Marengo lost to Burlington Central, 21-13. 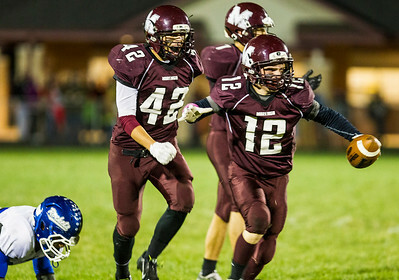 Kyle Grillot - kgrillot@shawmedia.com Marengo's Marc Bender (right) celebrates an interception with Dillon Csanda (42) during the second quarter of the homecoming game Friday October 3, 2014 in Marengo. 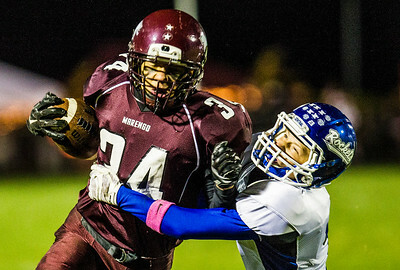 Marengo lost to Burlington Central, 21-13. Kyle Grillot - kgrillot@shawmedia.com Marengo's head caoch Matthew Lynch shots towards his players during the second quarter of the homecoming game Friday October 3, 2014 in Marengo. Marengo lost to Burlington Central, 21-13. Kyle Grillot - kgrillot@shawmedia.com Marengo's Craiton Nice (from left), and Brandon Temple watch as Burlington Central'sBrenden Bushy bobbles the ball before dropping it during the second quarter of the homecoming game Friday October 3, 2014 in Marengo. Marengo lost to Burlington Central, 21-13. Kyle Grillot - kgrillot@shawmedia.com Burlington Central's head coach Rich Crabel and Marengo's head coach Matthew Lynch exchange words over a referee's call during halftime of the homecoming game Friday October 3, 2014 in Marengo. Marengo lost to Burlington Central, 21-13. Kyle Grillot - kgrillot@shawmedia.com Burlington Central's Robert Doubek runs through Marengo's Brandon Temple and Drake Stravloplos during the second quarter of the homecoming game Friday October 3, 2014 in Marengo. Marengo lost to Burlington Central, 21-13. 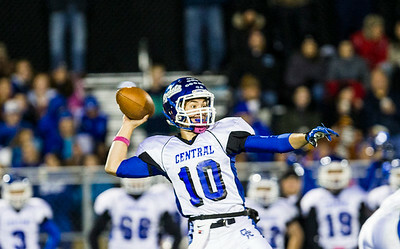 Kyle Grillot - kgrillot@shawmedia.com Burlington Central's Robert Doubek goes to make a throw during the second quarter of the homecoming game Friday October 3, 2014 in Marengo. Marengo lost to Burlington Central, 21-13. Kyle Grillot - kgrillot@shawmedia.com Marengo sixth graders Cari Hasse (from left), jennifer heinberg, and faith Mortysowicz huddle together to stay warm outside of the concessions before the start of the homecoming game Friday October 3, 2014 in Marengo. Marengo lost to Burlington Central, 21-13. 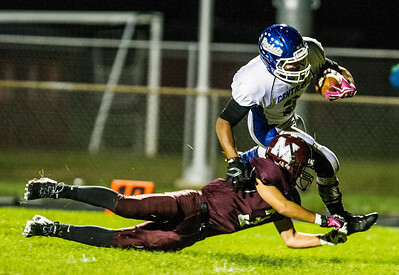 Kyle Grillot - kgrillot@shawmedia.com Marengo's Jarrell Jackson is tackled out of bounds by Burlington Central's Johnny Frederickson during the second quarter of the homecoming game Friday October 3, 2014 in Marengo. Marengo lost to Burlington Central, 21-13. 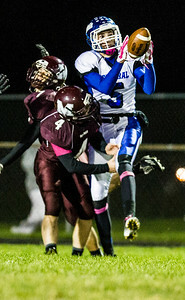 Kyle Grillot - kgrillot@shawmedia.com Marengo's Craighton Nice completes a pass during the first quarter of the homecoming game against Burlington Central Friday October 3, 2014 in Marengo. Marengo lost to Burlington Central, 21-13. Kyle Grillot - kgrillot@shawmedia.com Burlington Central's Bradley Sorenson celebrates his touchdown with Craiton Nice during the third quarter of the homecoming game Friday October 3, 2014 in Marengo. Marengo lost to Burlington Central, 21-13. 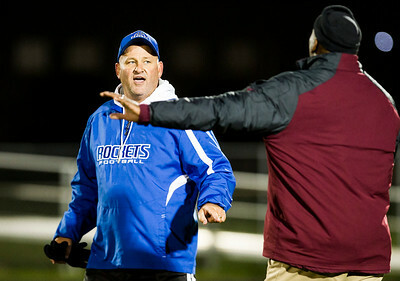 Burlington Central's head coach Rich Crabel and Marengo's head coach Matthew Lynch exchange words over a referee's call during halftime of the homecoming game Friday October 3, 2014 in Marengo. Marengo lost to Burlington Central, 21-13.